Rejoice in the Lord Always. Again, I say, Rejoice! Last week, as I sat in my chair, coffee in hand, in the quiet of the morning, I heard a bird chirping perky little songs of gladness from the tree outside my window. It was refreshing and it lifted my spirits in some ways. After all, who doesn't like the cute little chirpings of a bird? But as I sat listening, I soon found myself thinking, "That bird missed the memo". Not only was it the beginning of January, but it had also been fairly disgusting outside with rain, dark clouds, and humidity. But the bird seemed unaware of the gross weather. He seemed to be enjoying the day! In reality, I have no earthly idea what that bird was feeling. Maybe it was a mating call...or maybe he was angry. Or maybe he was a little bit off his rocker and genuinely did miss the memo. Regardless, my thinking that he had missed the memo sparked another thought: At least he's singing through the storm. I find it interesting that my first inclination was to say "why is he singing when the weather is so nasty?" What is it about me that assumes that there shouldn't be any singing when things aren't perfect? Unfortunately, I think this reveals something unflattering in my heart. I don't sing through the storm. I whine. I complain. I yell at God. I say the true things: "God is for me" or "God will work this for my good"; All the while, in my head I'm grumbling. In my heart, I fear God won't take care of me. God tells us to rejoice always. Always. Not sometimes. Not when the sun is shining. Not when I feel like it. I tend to just look at rejoicing as something I am supposed to do because God wants me to. Because He wants the glory. And while that is true. there is more to rejoicing than that. 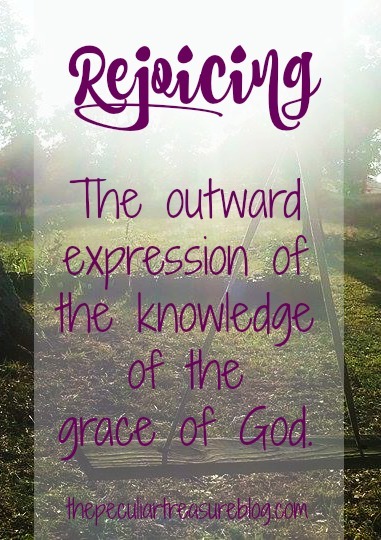 Rejoicing is an outward expression of our knowledge of the grace of God. Rejoicing says, "No matter what is going on around me, I know that I have the greatest gift in the world: Jesus"
We I look so intently at my current struggles and frustrations, that I forget that they don't compare in the slightest to the gift of salvation that God has given me (Romans 8:18). Who cares if it's raining? I've got the greatest Shelter in the world. Whether the storm is unavoidable, caused by someone else, or even if I caused the storm, God is still with me. He still loves me, and He still will fulfill His purpose for me (Psalm 138:8). He will still work all things for my good (Romans 8:28)- because I am His. The bird had it right. We should all be singing through the storm! 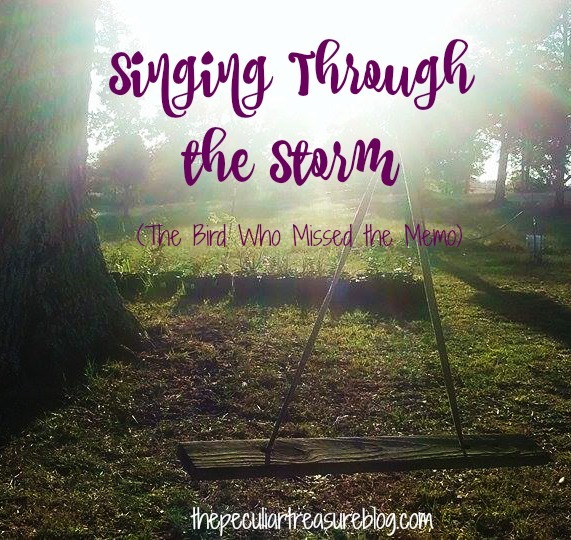 Have you been singing through the storm, or wallowing in a puddle? Yes! Exactly what we need to do! I so so so love this. to be able to sing through the storm.. regardless of our circumstances.. is an act of grace and strength and mercy of God into our hearts. I wish I could say that I normally sing through the storm but it's normally the other way around. But God still blesses me and brings me through. He is good! I'm right there with you, Katie! I am very bad at singing through the storm. But as you said, God is faithful despite my unfaithfulness! I'm glad you enjoyed it and I hope that it was an encouragement! I love this, especially the last paragraph! I try to rejoice through the storm, and my head knows all the truths you listed. Sometimes I struggle with my heart believing it too. If I truly was rejoicing then I shouldn't feel anxious. Soo...it's a process, and by God's grace I'm getting better. There is SO much to be thankful for that I try to practice gratitude daily. Usually, the rejoicing comes from that! I learned this lesson hard way, but it was so worth it. Rejoicing in the harsh storm is difficult, but not impossible. It's ll about your faith. Yes, yes! I completely agree. Rejoicing is so much more than feeling happy-- as you say, it's acknowledging the good news that has come to humanity. Yes! Exactly! Thanks for reading, Daisy! I hope you are doing well! Thank you for this beautiful reminder that we should always rejoice. That was beautiful! Thank you for writing this.